Helicopter Flights are available between March and October each year. Try a flight over Wilpena Pound, or the Chace Range. If you don't feel like driving there are lunch flights to the Prairie Hotel. The easiest way to climb Rawnsley Bluff – let Helivista take you to the top of Rawnsley Bluff in minutes. See below for details of our helicopter flight experiences in the Flinders Ranges. 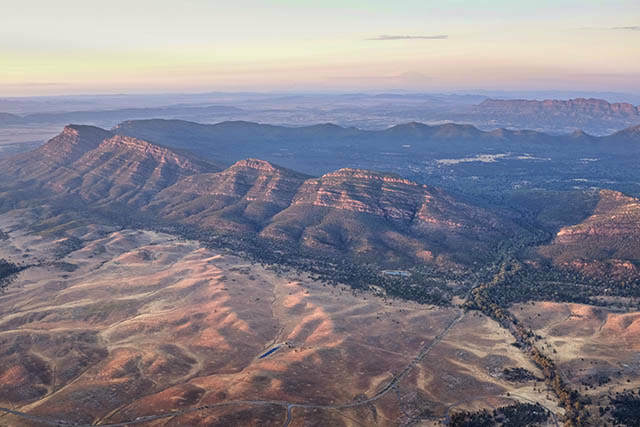 These flights provide a fantastic view of the Flinders Ranges and surrounds where you'll see Wilpena Pound from the air and some of the other stunning rock formations. of the area. 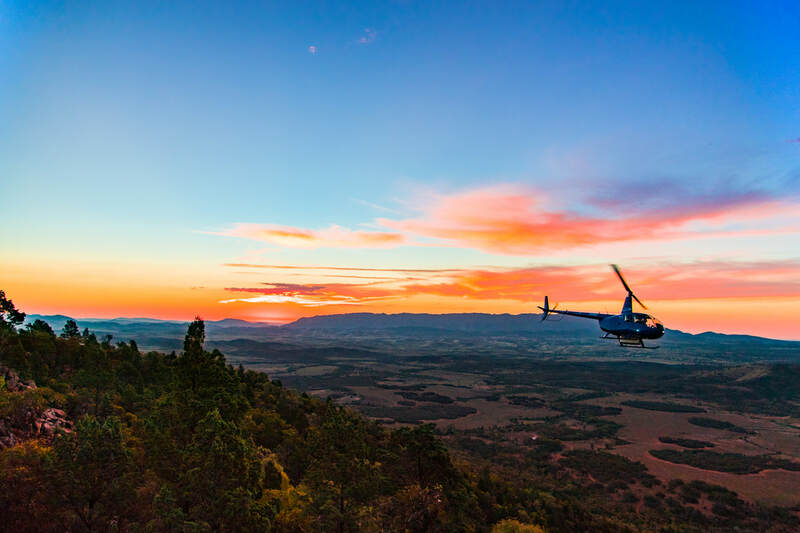 Pick up at Rawnsley Park Station and enjoy this magical flight around sunset to the Chace Range. Set down on top of the Range and enjoy canapes and bubbles, while you watch the sky and rock formations change colours, as the sun sets over Wilpena Pound and the Ikara Flinders . Start up again and be flown home. This is lovely way to surprise a loved one and enjoy some magical time together in this beautiful location. Pick up at Rawnsley Park Station. Enjoy a 20-minute Scenic Flight and 60 minutes at a secluded picnic spot for lunch with incredible views. Picnic provided. 4. Prairie Hotel flight including the famous feral lunch ! Pick up at Rawnsley Park Station with 1 hour of flying time. This flight will take you all around Wilpena Pound, Ranges and Gorges and end up at Parachilna to enjoy lunch at the iconic Prairie Hotel. This is one of the truly unique Australian dining experiences, and a must for anyone with an adventurous culinary side. Specialising in native Australian cuisine, the signature dish is called a Feral Mixed Grill - goat chop, kangaroo fillet and wallaby shaslick on mashed potato with gravy, plus a camel sausage thrown in for good measure! Not for the timid, but definitely worth a try! Fly back to Rawnlsey Park station via Edeowie Gorge with views of Salt lakes. Enjoy a feral lunch at the Prairie Hotel ! Who wants to sleep under the stars? This flight provides an overnight experience on the Chace Range. We'll fly you past Rawnsley Bluff, peak into the Pound and then head onto the Chace Range. Land and relax as we set up your swag for the evening. Watch the setting sun and then marvel at the milky way. We'll pick you up the next morning. Evening meal and breakfast provisions provided. Camp fire when available.